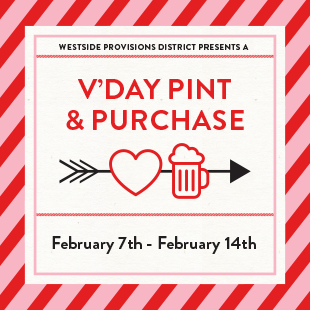 Westside Provisions is ready to play Cupid this year with the return of its much-loved “A Pint and a Purchase” shopping experience. Beginning Sunday, February 7, and running through Sunday, February 14, participating retailers at Westside Provisions will make shopping for your cutie much easier by keeping a “wish list” of their favorite things. Simply visit your stores of choice during regular business hours, shop the list your Valentine has created and you’re done! It is the perfect opportunity to purchase precisely what your better half wants for Valentine’s Day. Want to make their day even sweeter? Purchasing from their “wish list” earns you a free drink ticket redeemable for one beer at Ormsby’s and Little Trouble. Participating retailers include J.Crew, Pure Barre, Roberta Roller Rabbit, Room & Board, Billy Reid, Jeni’s Splendid Ice Creams , Le Jardin Francais , Lilith, Perrine’s, Preserving Place and Peridot West. For more information, please visit www.westsideprovisions.com.